Let me start off by giving you a little bit of context. This blog, my personal blog, is hosted on WordPress.com; but for other features, I also run multiple WordPress sites on my servers. Those sites are known as self-hosted WordPress sites. For many days, I’ve been looking into ways to combine all of my WordPress sites into one place so that I could post to all of them from a single location as well as manage plugin updates and other configurations. I bumped into a couple of services that provide this service. ManageWP and InfiniteWP being the best among them. However, I couldn’t continue using either of those services because I ended up hitting limitations on my free plan. They sell a service, so it makes sense that they put limitations. I can’t remember exactly what those limitations were as it was a long time ago when I tried both MangeWP and InfiniteWP. Fast-forward to today, I noticed a new version of Jetpack has been released. For those unaware, Jetpack plugin is created by the same folks who created WordPress.com. They are called Automattic (I’ve been trying to get a job there as Happiness Engineer 😉 ); and they have created a number of insanely awesome products such as Gravatar, Polldaddy, VaultPress, Akismet and not to mention WordPress.com. The idea of Jetpack is to bring feature parity between WordPress.com blogs and self-hosted WordPress sites. For example, the Publicize feature we enjoy on WordPress.com that lets us push our updates to the social media, the Social sharing buttons below each post, the Email blog subscription feature, Mobile theme, Contact Forms, New widgets, WP.me shortlinks, Stats (my personal favorite) and more can also be activated on self-hosted WordPress sites. All you need is a Jetpack plugin, which is free, and a WordPress.com user account, which is also free. Site Management is an integrated experience created by Automattic for all of WordPress. I use Jetpack on all of my WordPress sites, and I recommend everyone to do so. The new version 3.3 brings an exciting feature that will pretty much force everyone running multiple WordPress sites to use Jetpack because they can’t afford to miss it. With Jetpack 3.3, you can now manage all of your Jetpack-connected WordPress sites right from the dashboard of WordPress.com. Don’t be confused, you don’t have to have a blog on WordPress.com nor do you have to start blogging on WordPress.com unless you want to. When you use Jetpack, you need to create a WordPress.com account. You can use that WordPress.com account to log in to central site management and see all of your Jetpack connected sites. As you can see in the screenshot above, the new version of Jetpack not only allows you to edit and create posts to all of your self-hosted WordPress sites, but also enable to you configure your other site options such as Menus, Plugins, and Settings. Imagine this, when a new version of a plugin is released, such as Disqus for example, you would normally have to log in to all of your WordPress sites and update the plugin. But if you use this method, you can log in to your WordPress.com account and update this plugin to all of your website. Even better, you can turn on automatic update for this plugin on your sites so that you don’t have to worry about it later. Think of all the time you can save by using your “new home for all of your WordPress sites.” All of this feature is not limited to your computer, either. You can use your smartphone or tablet device to access all of these features. Pretty neat, right? Do you know that as WordPress.com bloggers, we get to enjoy new features before they are rolled out to the world of self-hosted WordPress users? Yeah. As part of that, we have been enjoying this new post editor at WordPress.com. If you blog at WordPress.com, you have definitely been prompted to try this already. If you don’t, you can see the screenshot above. The new post editor at WordPress.com is super fast, clean, and easy to use requiring almost no scrolling. There is a part that may be confusing a lot of people, but other than that, the new editor brings a whole new experience to the writers and bloggers. I absolutely love this. I had a feeling that this won’t be rolled out to self-hosted WordPress users. And I think I was right. WordPress.com did a clever thing and brought all the self-hosted WordPress site owners to WordPress.com’s editor to write post. Or at least they made a way to do so. The new post editor is definitely worth checking out. Unless you’re already using any of the paid solutions from other multiple WordPress site management services, you should really give this a try. In fact, even if you use other solutions, you should give this a go anyway. I’ve seen on ManageWP that they basically load up the dashboard of the actual connected site inside the window. With Jetpack and WordPress.com, you’ve got a whole new interface that is fast, intuitive, and easy to use. Plus, this isn’t the only thing Jetpack brings to your site. Take a moment and look through all the useful features that you can bring to your website with a single plugin. You seriously cannot afford to miss this. If you’ve already got Jetpack installed, all you need is to update the plugin to 3.3, which is available on your dashboard right now. Once updated, you will be automatically prompted to activate the new feature. Click Activate and you should be all set. If you aren’t using Jetpack already, go ahead and install this plugin on your website. After activating you’ll be prompted to connect your site to WordPress.com. If you don’t have a WP.com account, create one and connect. Trust me, you will not regret this. It’s an integrated experience created by the folks at WordPress for WordPress. How can you go wrong with this? Do you run multiple WordPress sites? How do you manage all of them? 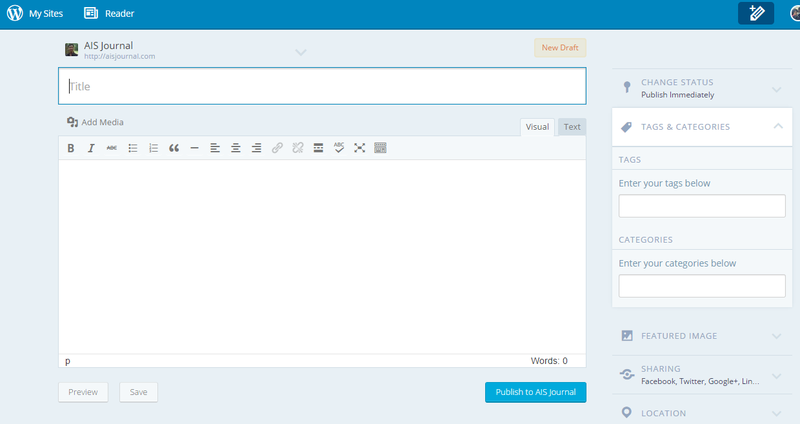 Have you tried the new WordPress.com post editor? What’s your take on this?